Hundreds of refugees and migrants from a camp in northern Greece have managed to get around a border fence and cross into Macedonia, according to a Macedonian police spokeswoman. However, a Reuters photographer estimated the number to be closer to 2,000. After walking for several hours, the refugees crossed a river while forming a "human chain" and found a way around the fence, which was put up by Macedonian authorities, photographer Stoyan Nenov said. Many of the refugees, who came from a camp near Idomeni, carried children on their shoulders as they crossed the river. 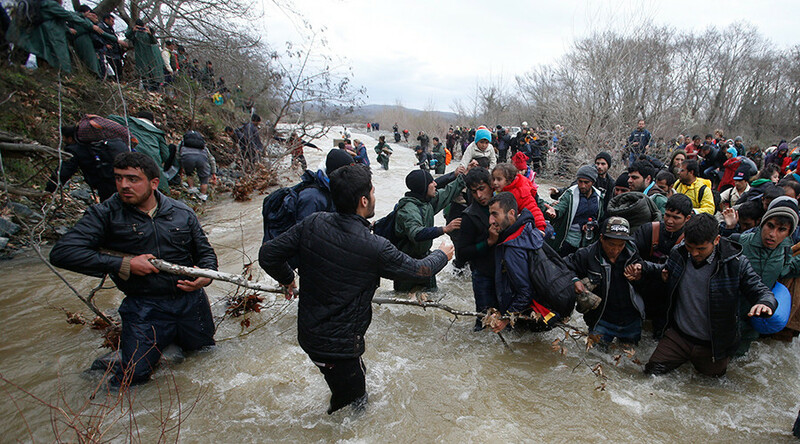 Greek and international volunteers used a rope to help the refugees across the fast-flowing waters, AP reported. After the crossing, the refugees found a break in the border fence near the Greek village of Hamilo and entered Macedonia. Some of the asylum seekers were picked up and put in army trucks by Macedonian soldiers, though it was unclear where they would be taken. 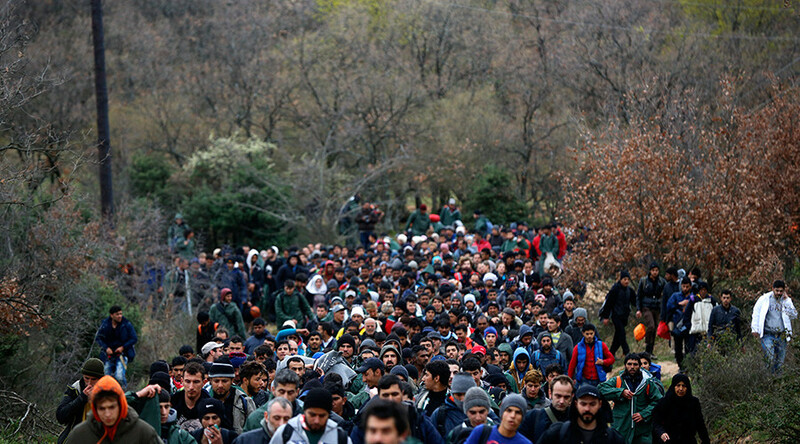 A spokeswoman for Macedonian police said: "We are taking measures to return the group to Greece...police and army have heightened security on the border at critical points." Parts of the border fence are made solely of coils of barbed wire, while breaks in the barrier occur at rivers and mountain slopes. The spokeswoman said she believed the number of refugees who crossed the border totaled "several hundred," a significantly lower estimate than the number given by Nenov. Earlier on Monday, Macedonia's Interior Ministry said that two men and one woman were found drowned near the Greek border after days of heavy rain. The three were believed to be refugees who tried to enter Macedonia illegally. Macedonia completely closed its border on March 9, leaving some 13,000 refugees stranded in Idomeni in desperate conditions. A total of 40,000 people are stranded throughout Greece. The border closure by Macedonia and other countries – part of a domino effect following a move by Austria to impose a cap on refugees – has forced asylum seekers to "take desperate actions" because they have become "desperate and frustrated," a spokeswoman in Macedonia for the United Nations refugee agency (UNHCR) said. EU leaders and Turkey are set to meet on Thursday and Friday to discuss the curbing of illegal refugee flows from Turkey to Europe via Greece. The leaders are expected to seal a deal in which Ankara would take back refugees who arrive in Greece from Turkish shorts, including Syrian refugees. In return, the European Union would speed up Turkey's EU membership application and Ankara's bid for visa-free access to the bloc for its citizens. The EU is also set to raise the €3 billion (US$3.3 billion) it had already committed to Turkey, in order to help it cope with the refugee crisis.